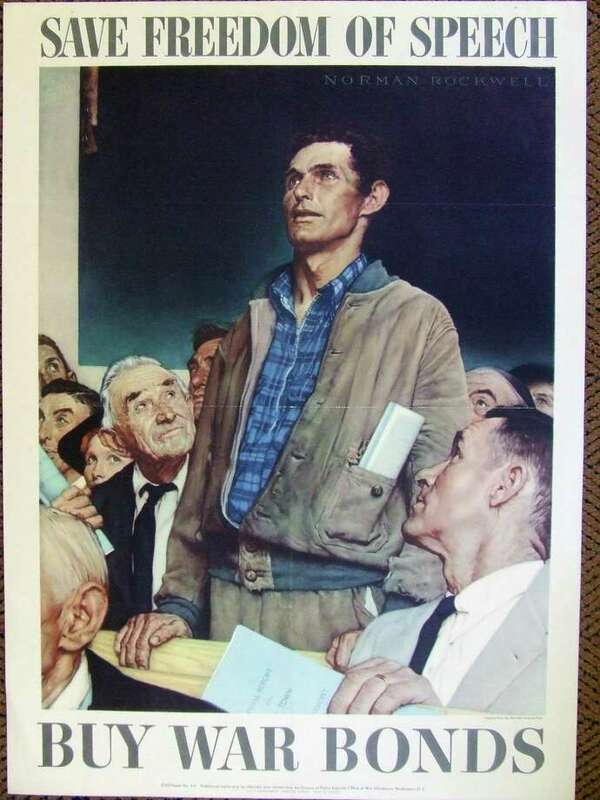 “Freedom of Speech” painting by Normal Rockwell. As Veterans Day approaches, we take a look back at one of the war-time posters from World War II. Urging Americans to unite to meet the challenges of wartime, the U.S. government issued posters to rally support for the war. Among the most recognized posters were those from Norman Rockwell’s series illustrating the “Four Freedoms,” outlined by President Franklin D. Roosevelt in 1941. Those freedoms were freedom of speech, freedom of worship, freedom from want and freedom from fear. Those four fundamental freedoms defined the values central to American life and explained the ideals behind the country’s war aims. Although the government initially rejected Rockwell’s images, explaining they sought the work of “real artists” rather than illustrators, Rockwell’s finished paintings eventually appeared in four consecutive issues of the Saturday Evening Post in 1943 and went on to become some of the most widely-reproduced images of the era, adopted by the U.S. Treasury as the centerpiece of a massive drive for war bonds. On Nov. 12, the Fairfield Museum (370 Beach Road) will commemorate Veterans Day with free Family Focus activities from 10:30 a.m. to 1:30 p.m. Families can learn about some of the hometown heroes who have served the community and country, view historic uniforms from the museum’s collections, enjoy a scavenger hunt, and create a craft. Families will also be able to write letters to the troops, in care of Operation Gratitude. In addition, the museum is also collection donations for Homes for the Brave, a local nonprofit that provides housing and services to individuals experiencing homelessness, especially veterans. Family Focus days are generously sponsored by People’s United Bank. If you want to bring a donation for Homes for the Brave, the wish list includes paper goods, toiletries and cleaning items (body wash, deodorant, laundry detergent, liquid hand soap, lotion), food (powdered creamer, brownie/cake mix, snacks, tunafish), backpacks or duffel bags (new), and mugs. The year Normal Rockwell’s paintings eventually appeared in four consecutive issues of the Saturday Evening Post.